New Russian anti-terrorism legislation, which would require all encrypted communications in the country to have a backdoor and allows records of all communications data to be retained, have been condemned by the US Whistleblower Edward Snowden. The new laws, which we reported on last week, were passed by the countries lower house, the state Duma, on Friday. They allow for the collection of the content of all phone calls and text messages for six months, and the records of them for three years. In addition, all social networks must keep content records for a minimum of one year, as well as decrypt any encrypted content if requested by law enforcement bodies. If they fail to provide this encryption backdoor they will be fined. It also creates a new crime of ‘failing to report knowledge of a crime; which will carry a maximum sentence of one year in prison and the crime of inciting or expressing approval of terrorism online will be applied to social media posts and carry a maximum penalty of seven years in prison. It’s a brave stance for Snowden to take since he is currently living under asylum in Russia after he leaked details of the US’s National Security Agency extensive programme of internet and telephone surveillance. Russia is one of the few countries in the world that has not pledged to extradite him to the USA, and given that these comments come on the same day that a Norwegian Court refused to grant him safe transit to collect a humanitarian award, the comments can be seen as brave, and perhaps even foolhardy. 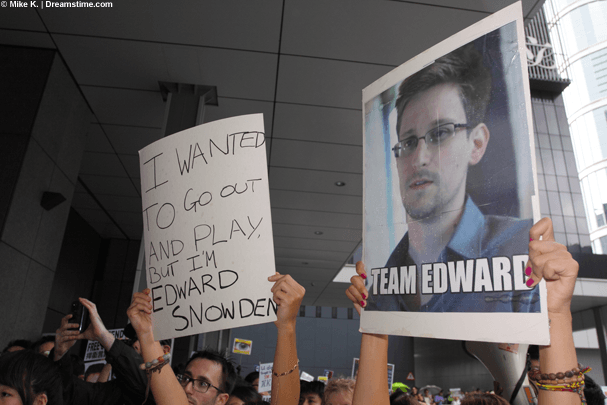 Snowden is not alone in condemning the new legislation. As well as a variety of human rights and privacy campaign groups, Russian opposition politicians have also been scathing in their commentary. Another, Yuri Sinelshchikov warned that they would be open to the significant risk of abuse by state officials. But the opposition parties in Russia rarely have the chance to significantly impact government legislation, and the only concessions that were won from the draft legislation were the removal of clauses that would have allowed the removal of Russian citizenship, or the right to leave Russia, from offenders. Having passed Russia’s lower legislative house, it now moves onto the higher one; the Council of Federation. As membership of this is also weighted heavily in the ruling party’s favour, it seems inevitable that it will pass here unchanged, and this is expected to happen in the next week. After that, all that remains is for Russian President Vladimir Putin to sign the bill into law. Of course, even before these bills, Russia was not exactly renowned for its online freedoms, with state censorship and surveillance already pretty widespread. As a result, VPN use in the country in pretty high, and new laws which further erode individual privacy online are likely to drive more users to seek to hide themselves online. A VPN can render users almost totally anonymous, and the only data an ISP can see is an encrypted connection to an unrecognized server. Quite what steps Russian authorities might want to take against VPNs remains to be seen, but for now, Russians who want to avoid this “unjustifiable violation of rights”, as Edward Snowden described it, are likely to turn to VPNs in ever greater numbers.